← Seriously. They shouldn’t let kids have these things. My parents grew up in times when people didn’t have a lot. Their parents had gone through the Great Depression, and there was never a lot of money for clothes. Or anything else. Sort of like life on Walton Mountain without the annoying John Boy voice overs. They worked really hard to make sure that we had an easier life than them. I never appreciated it at the time. They say as you get older, your parents get smarter. My folks are geniuses. So when my brothers and I came along, we always had duds. Not that we ever called them duds. I just like saying duds. We may not have dressed like Fancy Boys, but I was never embarrassed to go to school. Except maybe for the time I accidentally cut my eyebrow off. Ma let me use her eyeliner pencil and assured me it looked fine. And maybe my unfortunate paisley Nehru period. But I digress. There was one small problem: We were in our teens in the mid-’70s. We were devotees of the anguished jeans. Back then, you didn’t have people in sweatshops to beat your jeans into oblivion; you did it the old-fashioned way. Days and weeks and months and years of wearing them to a pulp. Holes? Heck, yeah. The more faded, the better. We pretended to be hippies, although we lived in San Angelo, where the left-wing counterculture consisted largely of one mysterious store that sold God knows what. I don’t think I ever went in to find out. Ma would be aghast when we set out in our tattered jeans. “People will think we can’t afford to buy you clothes!! !” she would lament. Oh, Ma, I would reply. Oh, Ma is a pretty good universal response. Probably what led to my current universal response of oh, you know. She would stealthily throw jeans away. We would recover them. Repeat as necessary. I find it funny that all these years later, Mo wears jeans with a huge hole in the leg and I berate her greatly. She just says, oh, Ma. Actually her reply is far more colorful, but that’s a different story. 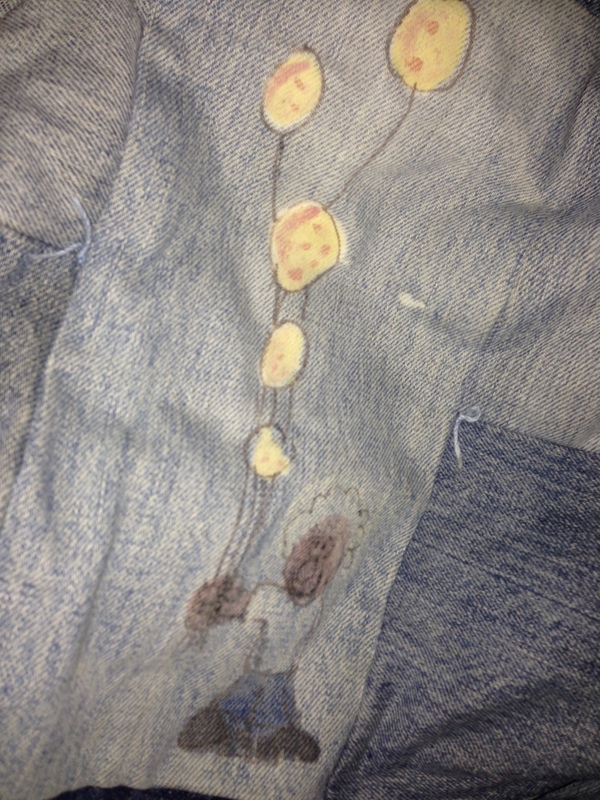 Anyhow, once I had the perfect pair of jeans. They were faded almost white, with the bottoms frayed in a way that we deemed cool at the time. I loved those jeans. They met an unfortunate fate. Five large splotches of bleach landed along the front of one leg. I don’t recall what happened. Accident, sabotage, Magic Weasels before I knew there were such things. The pants were ruined. Which should have made Ma happy. Instead, she got me fabric markers. I was able to paint a little guy holding balloons, which were on the spots the pants had turned white. It was pretty cool in a mid-70s you had to be there sort of way. I wore them for a long time afterward. When it finally became time to retire them, did she celebrate the demise of her nemesis? No, she took them and other antique jeans and turned them into a quilt. It was the coolest thing I owned. It still is. She taught me a lot of lessons over the years. How to make oatmeal cookies and play “Greensleeves” on the organ and put a worm on a hook and fear God in a good way and be kind to people because that’s just what you’re supposed to do and that if there’s a tornado warning you should drive 20 miles through the middle of nowhere to get to the grandparents’ storm shelter (jury’s still out on that one) and that the Kingston Trio were hip before I knew what hip was. She and Dad made sure I had the world’s only left-handed catcher’s mitt and unlimited crayons and a Sting Ray and the opportunity to do anything I wanted with my life. Anything. That’s all you need to know about my mom.